IT is a change of direction that could see departure times for city flights cut in half and bring the Capital’s airport into the 21st century. A six-month trial of a new take-off route for flights leaving Edinburgh started yesterday, with all ears on the reaction of local communities it passes over. If the trial is a success it could cut the minimum interval between take-offs from two minutes to one minute, doubling the potential number of flights by large planes from the hub and increasing the total number of flights in and out of the Capital by 20 per cent to around 120,000 every year. As well as extensive consultation the airport has installed noise monitors along the new route, which will see southbound planes take off over Broxburn and Uphall, before turning east over the Forth, then south over East Lothian – by which point they should hit a minimum height of 13,000ft. And after the first day there seemed to be little concern from affected residents – although the airport admitted it was expecting a mixed reaction in early days. Fraser Graham, treasurer of the Uphall Community Council, said they had not been spoken to by the airport ahead of the trial, but admitted that it was too early to tell what the change would mean for people. “There’s not been a lot of concern locally, but we will keep an eye on it. Edinburgh Airport is Scotland’s busiest airport, with more than 40 airlines serving 100-plus destinations and over 10 million passengers passed through the airport in 2014 – the busiest year ever for a Scottish airport. And that means increasing the number of flights could provide another step up. Martyn Day, the MP for Linlithgow and East Falkirk, said he had not had any feedback from local residents and admitted it was case of waiting to see what happened. “I’m aware the trial has now started and Edinburgh Airport was very upfront and said some residents had expressed concerns, but we will need to see how it goes. “It is not a great deal of extra noise, as I understand it, but it is a very rural area where any extra noise will be quite noticeable, so it will be difficult to tell what people will think. 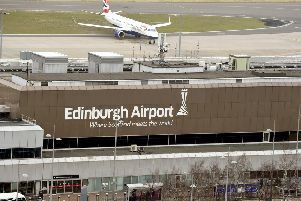 David Wilson, chief operating officer of Edinburgh Airport, said: “A trial like this is of vital importance as aircraft currently flying above Scotland are on a network designed in the late 1970s. We’re aiming to upgrade the airspace around Edinburgh Airport, bringing it into the 21st century.